I recently visited my hometown of Atlanta and, during a visit to a local nail salon, I noticed one crucial way that nail salons can help set themselves apart from the unfair “dime a dozen” stereotype — branding. Sugarcoat: A Nail and Beauty Bar in Atlanta’s Buckhead neighborhood stands out amongst the other salons in the city because it’s developed a unique brand that’s reinforced through every aspect of its business. This brand recognition has helped it earn consumer choice awards, a large repeat clientele, and a hopping spa party scene. The branding ideas of this natural nails-only salon can definitely help your own salon stand out. A crystal chandelier serves as the distinctive icon for the salon. Co-owners Colette Lievano and Christie Shepard bought the unique chandelier to hang in the space, then commissioned Atlanta graphic artist Sheila Aldridge to draw a rendition of it to use in other places, like a large wall decal. The duo also commissioned Tracey Potter, of TAP Design Studio in Chicago, to create the fitting Sugarcoat logo, a girly cursive design with fun flourishes that appears on a large menu board, the printed menu, business cards, and other promotional materials. The salon even sells a line of T-shirts that promote its business. 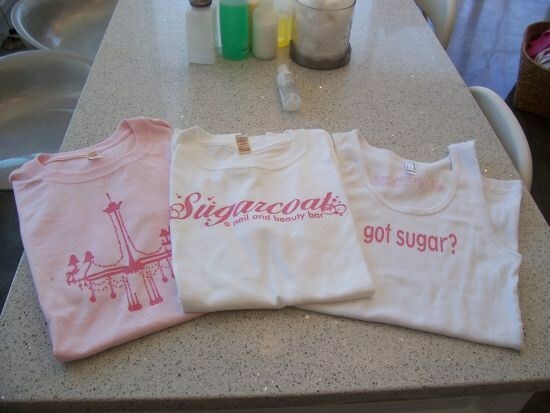 With cute phrases like “Got sugar?” (with “Sugarcoat” named on the back) or the chandelier drawing, the popular shirts can be seen throughout the city. “The shirts started out as part of the salon uniform, but clients kept asking about them so we added them to our retail selection,” Lievano says.